This is another one of our favourite restaurant dishes. We almost usually order this dish when eating at our favourite Hongkong-style noodle houses. Sometimes we would have it served on top of rice. Sometimes, on top of some noodles in soup. I can't quite decide which way is my favourite, so when we set about trying to recreate this dish at home, we decided to do both. The cut of beef known as "beef brisket" has been a source of confusion for me for a long time. I thought we figured out the mystery behind the term (see Dancing Cilantro Beef), but I've come to accept that sometimes the name might refer to any of the following cuts: brisket of beef, the shin of beef, or veal breast. For this dish, I chose veal breast. It had the right mix of tender meat, fatty bits, and chewy layers. I don't know exactly what this chewy layer is called in English: most probably, it would be discarded as "gristle." The "gristle" is quite essential to the enjoyment of the beef and I can never be bothered to trim the gristle. Because -- well, you know. 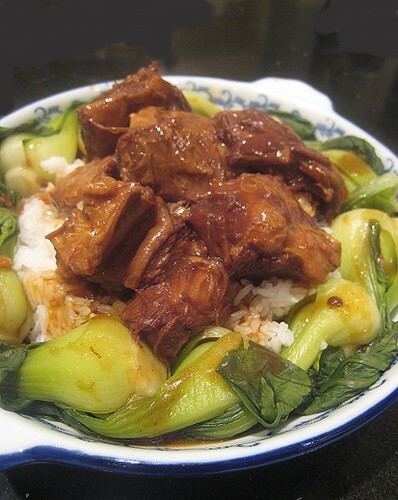 I've been searching for a recipe for Cantonese-style braised beef brisket for some time. I figure it was braised in a soy sauce mixture, with the usual aromatics (ginger, green onion, garlic), and I figure it must have some five-spice powder in it, or at the very least, cinnamon (or cassia) and star anise. But there was something missing when I cooked up a batch of beef brisket. I mean, it was pretty good but it lacked a certain note. I trolled the Internet again and discovered Chu Hou paste as the essential ingredient. I have no idea what Chu Hou paste is made out of. All these Chinese pastes, sauces, and "bean things" in jars look the same to me. Reading through the ingredient list does not help, because it would list the usual ingredients (soybeans, water, salt and so on and so forth) with nary a variation between different jars. Nevertheless, I decided to purchase a jar and see if it will work. To make a long story longer, it did work! When one bit into the beef (or veal), one can definitely taste the chu hou paste. It adds more of that licorice-y, anise-y bite to the beef. The licorice-y note is more focused, which is why I think to attribute it to the paste than the star anise in the braising liquid. Besides, I find that adding too much star anise in the liquid makes my head spin in a not so pleasant way. I find it much too overpowering. We're all out of the paste now. Of course, I'll buy another jar, but I also want to try this dish without the paste. If anybody knows for sure what the ingredients are in Chu Hou paste, please pass the information along. This dish is our usual dump-into-a-pot deals. The "recipe" below assumes the use of Chu Hou paste. 1. Cut beef in cubes. I usually do biggish pieces (1.5 inch x 1.5 inch) because I braise to tenderness and the pieces always end up smaller than the original. 2. Brown beef, if you are feeling industrious and there are no taped Law and Order or House on the DVR that you need to watch. 3. Otherwise, heat up some oil in a pot. I like to add a dash of sesame oil to whatever oil I'm using (usually canola although peanut would be nice). 4. Add ginger and green onions. Saute. 6. Add beef cubes. If the cubes are not browned because of that new Law and Order episode, then, per Mama, just cover the pot with a lid and let the beef steam until not bloody anymore. 7. Add a dash of Shaoxing wine, for "that depth of character, a roundness" (as we have discovered Kylie Kwong to say a lot). Cook out the wine a tad. 8. Add the Chu Hou paste (two to three tablespoons is enough for about 4 pounds of beef). 9. Stir around the beef and coat with the paste. 10. Add soy sauce, approximately half a cup, plus water. 11. Add one star anise and a cinnamon or cassia bark. 13. Braise until tender. Check for seasoning. 14. Upon serving, to make it more "restaurant-like," take out the beef pieces and strain the braising liquid. 15. Thicken sauce with a cornstarch slurry. 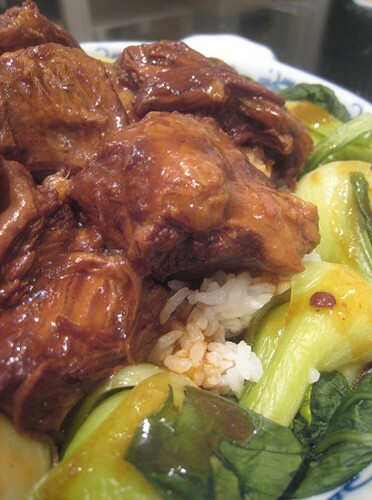 Your Cantonese Braised Beef Brisket is now ready! 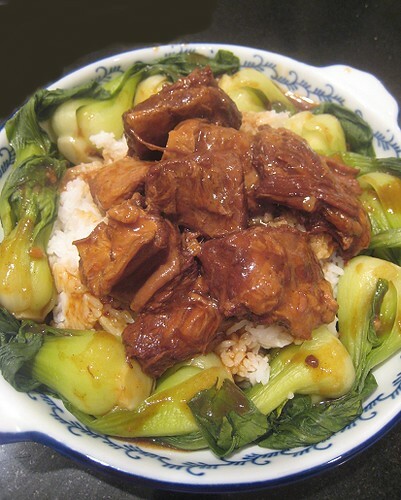 In our restaurtant-ordering experience, ordering this "on rice" usually entails a circular dish with the beef brisket in the middle and a bok choy border. That's what TS tried to recreate here. Cantonese Braised Beef Brisket: "Wonton Noodle Soup"
I, myself, wanted my beef brisket on top of some egg noodles so I bought some from the supermarket. I made a quick broth for my egg noodles. I learned from Annie (of House of Annie) that one can use dried anchovies steeped in water for stock. I did just that and added some dried shrimp for the "shrimpy" taste of wonton soup broth. I added some Shanghai bok choy to the broth, put in the blanched noodles, and topped the whole thing with some of the beef brisket. It was delicious! Tasted very authentic, like what I get from the noodle house. And that's it! Another "mysterious" Chinese restaurant dish tackled! I make this dish too. Pretty much the same way. Chou Hou sauce is the vital ingredient. I Will be making it for the CNY reunion dinner on Sunday. jeez ~ looks amazing!!! and i agree w/ you about the collagen in anything to be braised/stewed: it's the best part!!! mmm... This looks fantastic. The star anise really shines in beef dishes, doesn't it? Love the ease of this! oh, thank you thank you for taking the mystery out of this dish, it's my favorite as well. Now I can make it at home. Gotta get some chu hou paste now! Funny you posted this - I was at the market earlier today and came across this very brand you posted and wondered at the store what this could possibly be used in! Now I know and I have a reason to go back and pick it up! I've had the braised beef at the restaurants and thought the same things you did as far as ingredients it included. I hope to make this soon using pork! So this is the trick! I've been wondering what was missing too!Thanks. Wow! An excellent recipe. Looks great too. Oh braised beef, what can't you do? Great job! 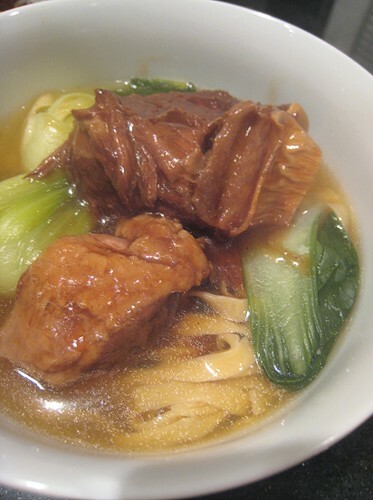 I always like to get the braised beef noodle dish when we go out for Hong Kong style soup noodle. I think the star anise is absolutely essential. Seriously this is one awesome dish. I would love to have a nibble followed by a full serving! Those photos of the tender hunks of beef has me drooling. I have a bit of a sauce fetish and at any given time my fridge is about half full with sauces, so I'm totally going to buy some chee hou the next time I'm in Chinatown. All the different bean based sauces do get really confusing. Glad you found the one you were looking for so you could make that beautiful dish! looks great - good thing you figured out how to purchase that "certain something" that was missing. 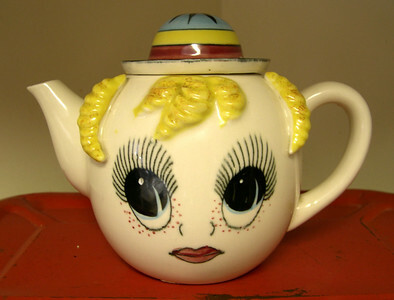 I"m going to look out for this in the shops next time I'm in Chinatown. maybe i could find it there. That braised beef looks tasty! Thanks! And it really was very, very tasty. These Chinese things are so mysterious, haha. Haha. Braised beef is magic. Oooh, I love slow-cooked brisket, although this way of serving it is new to me (clearly we don't hang out in the same restaurants ;-)) Glad you found the Missing Mystery Ingredient! Wow what a meal. I've never heard of Chu Hou Paste. Don't know if I can find it in Comox Valley. They have so many different sauces that we never know which one is is a dish. Great job on this one. Supposedly, there are other/more "mystery" ingredients for this dish as well. One day we will find out what it is (or, they are)! Excellent recipe, thank you! Does anyone have any idea how long this takes to cook until tender? I only have about 4 hours up my sleeve and am worried it will still be tough! Thanks! 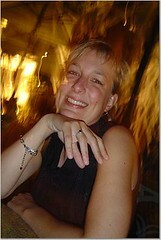 Hi Kate! I think 4 hours should be enough in terms of braising time, especially if they're already cut up into the smaller pieces.